2 weeks ago we bought our dream home and we still have not moved in yet. When you own 2 houses, there is no hurry I guess. We are trying the FSBO route first and hope to sell our house fast. Until we sell our old house I am on super thrifty mode. 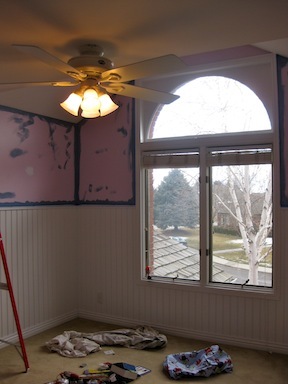 Before moving into the new (old, but new to us) house, I wanted to paint the kids bedrooms. They all wanted new bedspreads to go with their new rooms. I was able to paint all 3 rooms and get new bedding for just the cost of paint. I had already gotten my 3 year old son's bedding at Target last year when they were clearancing out their robot themed bedding. I got a full bedspread with matching sheets for under $20! I will need to do a little sewing to make the bedding fit a twin size bed, but then I will have extra fabric for decorating. I got my oldest son's bedding last year on clearance at Bed Bath & Beyond. I got a quilt from Nautica for under $20 (normal price was over $100). I got my daughter's Bobby Jack bedding from Amazon for free thanks to Swag Bucks. My oldest son was very upset about moving until I had him paint his own room. Now he has more of a vested interest in the new house and is excited about his new room that he painted by himself. Yay! This is a picture of my 3 year old son's new robot room in progress. It was pink, but is a beautiful blue now. The combination of the pink and blue here reminded me of my high-school days when I loved dusty rose and light blue. I can't imagine loving those 2 colors now and was happy to finish up this room. As for these kitchen cabinets I took all of your advise from the 72nd Penny Pinching Party to heart. I had posted that I was going to paint them an off-white color before moving in. 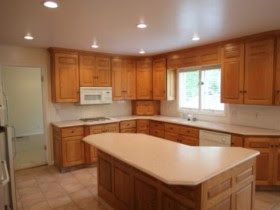 I have to agree that light colored cabinets show the dirt more and painted cabinets wear from cleaning. I was worried about those issues so I appreciate the good and honest advise. I cleaned them up with soap and will live with them as is until I can afford to do the job right. They are still really nice cabinets and have some years of use left in them. I will post more pictures as I get moved in. My decorating budget right now is $0, until I sell my old house. I am my most creative when I have to be thrifty, so it will be fun. Now share what great thrifty things you have been up to! I can't wait either! We just bought our first house ever. It was built in 1853. It's so fun to be able to do whatever I want and on limited funds it's fun to see what we can come up with! have you considered painting them black? Finding Fabulous (blog) did her's last year and they looked amazing! I painted mine white...they do show everything and need a touch up already after only 3 years. What a beautiful new home! I am a fan of natural wood cabinets, I think they look great! Thanks for hosting this fun linky party, I look forward to it every week! We are in the same situation- 2 mortgages. My husband accepted a new job out of state and our home back in Arkansas still hasn't sold after nearly 2 years on the market and huge price drops. We tried renting it but the renters didn't work out so well. It's not easy to carry 2 mortgages, but it can be done, especially for us "thrifty girls" Best of luck on selling yours quickly- they say the market is starting to turn.